One of the strengths of the DISC Model is identifying DISC styles of others. Learn 3 simple steps to improve your observation skills. You will need to practice identifying DISC styles of others, but it's a skill that is easy to learn. In doing so, you can adjust your style appropriately to improve your interactions. How Do I Start Identifying DISC Styles of Others? We focus on a 4-step approach to improve our daily interactions. First, you’ll need to understand DISC; how we are similar and different. Next, you focus on self-awareness by knowing your own DISC style. We are focusing on the third step, which is identifying DISC styles of others. Ultimately, you want to modify your behaviors appropriately to improve interactions with others. As you become more familiar with the DISC styles, you will find some people are easy to identify. You will quickly think to yourself, "she's a D-style" or "he's an S-style". You can easily identify these people when they are primarily one style. The rest of the people you encounter may take a little more practice and effort. OAR is an acronym that stands for Observe, Assess, and, Recognize. It's a simple 3-step process that you will learn quickly. Once you've practiced it, you will be able to easily include identifying DISC styles of others into your daily interactions. The skill is not limited to face-t0-face interactions. Consider using it when you are on the phone or corresponding via emails and texts. In addition, you may observe others over long or very brief periods of time. First step to identifying someone's DISC style is to simply observe behaviors. What does the other person tend to talk about? S-styles prefer to focus on family and relationships. What if they tend to focus on hobbies, accomplishments, or name-dropping? Do they talk a lot or do they say nothing at all? Are their emails short or long and detailed? You're looking for patterns in their behaviors. Next, consider how they tend to say things. What type of words do they use? For example, D-styles and I-styles are more individualistic and may tend to use the pronouns "I" and "me". On the other hand, S-styles are considered to be team players of the DISC profiles. They may prefer to use plural pronouns like "we" and "us". C-styles tend to be more economical in their choice of words; whereas the I-style loves using superlatives. For example, when a C-style tells you something is "good" or "fine" it really is a positive response. I-styles, on the other hand, are more like to respond and use words like "amazing!" and "fantastic!" 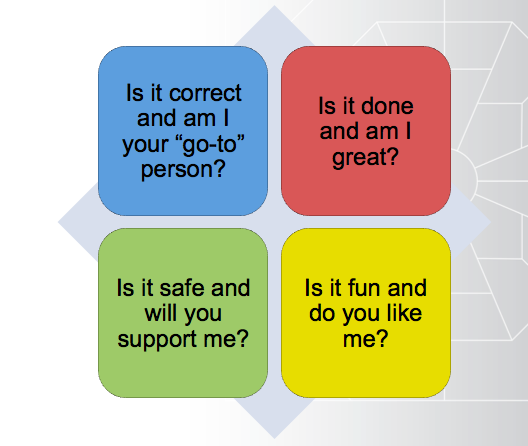 You should consider the types of questions people ask. D-styles tend to ask the what questions. For example, they may ask, "what's the bottom line?" I-styles tend to ask the who questions. S-styles tend to ask the how questions and C-styles tend to ask the why questions. Also, when using sentences, do they tend to ask you to do something or do they tend to tell you to do something? Listen to their tone of voice. Do they tend to talk in a louder voice or more quiet voice? When they speak do you hear a lot of inflection or are they more monotone? Do they speak with confidence? Are they more emotional? Body language is a highly useful way of identifying DISC styles. In addition, it can be a quick way in identifying DISC styles of others. Is the person's body language animated? For example, do they talk using their hands or use a lot of facial expressions? Is their body language more still and closed? Not only is it quick, but you may even be able to recognize someone's DISC styles before the verbal exchange occurs. Let's say you're an I-style and about to meet a prospect. He's walking towards you. You notice he's not making eye contact and he appears hesitant. You're likely thinking your prospect is going to be more reserved. Now is the time to remind your I-style self to approach slowly, tone down your voice, and don't overwhelm. Observation is a critical skill. However, with practice, you will find more success in your interactions. If you identify someone as people-oriented it does not mean you'll never see S-styles and I-styles not do tasks. In reverse, task-oriented doesn't mean D-styles and C-styles can't or won't interact well with others. It simply means these are their natural preferences and tend to be natural behaviors. The more you observe and assess the easier it becomes. Now that you've observed, you can move on to the next step; which is to assess. Step 2: A Stands for Assessing: Reserved or Active? Once you've identified patterns of behaviors you ask yourself two basic assessment questions. First, determine if the person appears to be more Active or Reserved. Does the person tend to talk about future and how things could be? Are they more likely to talk about themselves as individuals? Is their body language more animated or assertive? Do they maintain strong eye contact? Do they speak with a louder voice and use lots of inflection. If so, they will more likely be on the Active half of the DISC Diamond, and therefore, either D-style or I-style. On the other hand, do they talk more about present and past and how things are now? Perhaps, they speak with a calm and fairly quiet voice. Is their body language more reserved and still? Do they tend to avoid eye contact? If so, the individual is like to be on the Reserved half of the DISC Diamond, and therefore, either S-style or C-style. 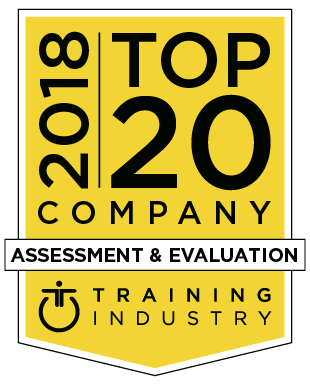 Step 2: A Stands for Assessing: People-Oriented or Task-Oriented? Now that you've identified Active or Reserved, you will need to determine if the person is more Task-oriented or People-oriented. Do they talk and ask more about things? Do they focus more on tasks than on feelings and people? Are they less emotional? 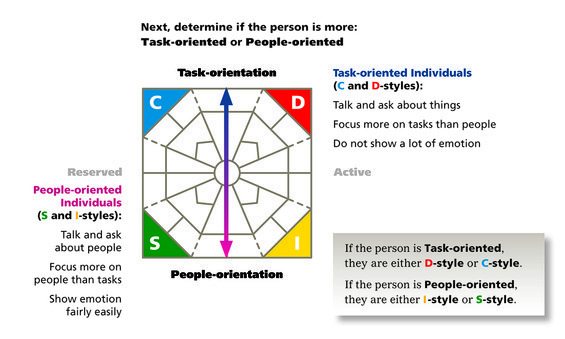 If you've identified the person as Task-oriented, then they will be either D-style or C-style. Let's say the person talks and asks about people. They tend to focus more on people and emotions rather than tasks and things. You notice they show emotion fairly easily. If so, the person is more likely to be People-oriented, and therefore, either I-style or S-style. Now you have the information needed to recognize the person's DISC style. 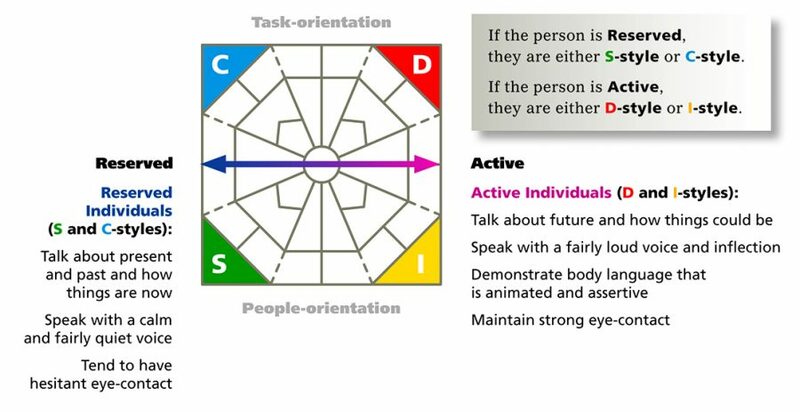 You've used your observations to determine which 2 halves of the DISC Model the person is most likely to be on. By narrowing down the halves, you end up identifying the one DISC style the person is most likely to be. Try reading this exercise to recognize Vicky's primary DISC style: "Vicky is a calm and logical person who does not like sudden changes. She tends to keep her opinions to herself and therefore, tends not to speak up. Vicky wants clear instructions and directions she can follow. She likes to work in a team and values a supervisor who is honest and trustworthy. Vicky is very loyal and conscientious when she's treated fairly. She's able to focus on small details and repeat tasks comfortably." Did you identify Vicky as an S-style? In summary, D-styles are Active and Task-focused, whereas, I-styles are Active and People-focused. S-styles are Reserved and People-focused, whereas, C-styles are Reserved and Task-focused. You will discover that observing behaviors becomes second nature and you will soon be doing it without thinking. The skill is part science, part art, and mostly PRACTICE. The bottom line is using DISC helps you communicate better with others.